At the point when a site owner looks for a suitable web hosting platform, the most imperative aspect is the amount of bandwidth required for the website. One can pick an appropriate web hosting platform once the bandwidth requirement of the website is known. The facts demonstrate that many web hosting packages offer unlimited bandwidth, however, you should be careful while opting for a plan with unlimited bandwidth. Each hosting organization has their own definition of 'unlimited', so, it is imperative to go through the TOS of the web hosting organization before you agree to sign up for any hosting package with unlimited bandwidth. However, before we get on the topic how much bandwidth is really required for your website, let's first comprehend what bandwidth really is? Bandwidth is the term that is utilized for evaluating the rate of data and traffic that is permitted to be transmitted between the users and your website through the internet. Bandwidth implies the maximum amount of data that can be transferred in a given period of time; this data is typically measured in seconds. For the website owners, it is preferable to choose a web hosting plan with a higher bandwidth as it means better speed, better network, and better connectivity. How bandwidth affects your website? The less bandwidth you have, the additional time it takes for your website to load totally regardless of the type of connection utilized by the visitors. Visitors will have to wait till your website loads if your website is not supported with adequate bandwidth. How to calculate the bandwidth needed for your website? With inadequate bandwidth, your website may wind up inaccessible to the visitors as you have reached the maximum limit of data permitted to be transmitted. It is vital to decide on a hosting plan that offers adequate bandwidth and choose hosting providers who offer scalable hosting solutions. It is imperative to know the genuine bandwidth required for your website to sign up for a service that is best for you. 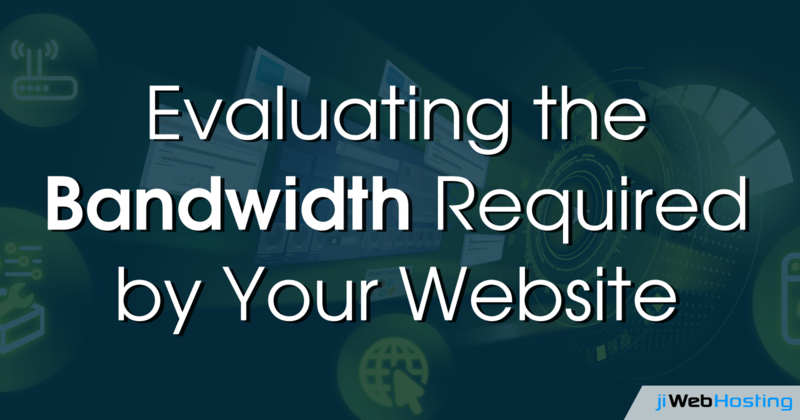 Here is how you can calculate the bandwidth required by your website. Determine the average page size of your website in kilobytes. Multiply the average page size by the monthly average number of visitors to your website. Multiply the result obtained from step 2 by the average number of page views per visitor. The formula mentioned above is just the baseline for knowing the real bandwidth required for your website. While calculating bandwidth it is additionally imperative to incorporate some additional space in case there is a spike in your website traffic. Preferably, you should have at least 50% extra space for the traffic spikes. If your website does not include big media files or if a lot of online streaming is not involved, then a hosting package with 10 GB bandwidth every month will be sufficient for you. On the contrast, if you have users streaming online videos, downloading or uploading documents on your website, you require more bandwidth to keep your website going. Also, in the event that you change your website's design and layout, it may result in an increase in the size of your website pages and thus more bandwidth will be required. Growing traffic to your website also requires more bandwidth to complete the website functions without making the website slow or without bringing on any downtime. The exact estimate of bandwidth required by your website relies on a variety of factors. You should consider different elements like traffic spikes, downloads from your website, online shopping transactions etc. while calculating the bandwidth for your website. It is important to have a thought regarding the future development of the website before purchasing any web hosting package. If you have a plan for what you will do with your website, you will have a better understanding of the amount of bandwidth required for your website.